IN SUBMITTING FOR A BUILDING PERMIT IT SHALL REQUIRE A PROPERTY SITE PLAN TO BE PROVIDED, WHICH IS DRAWN TO THE CORRECT SCALE. THIS PLAN MUST ALSO INDICATE ANY P.U.E. 's, BUILDING SET-BACK AND ANY OTHER USABLE SPACE RESTRICTIONS. Opening Height - " min. clearance : ______" Width - " min. clearance : ______" Area - SQ.FT. min. clearance : ______SQ.FT. Sill Height - " max. : ______"
CHECK THE BOXES THAT BEST DESCRIBES THE TYPE OF INFORMATION THAT IS TO BE EXHIBITED PER THE APPLICABLE CODES. KNOWING IF ELECTRICAL, PLUMBING, HVAC, ETC..WILL APPLY, SHALL ALLOW US TO QUANTIFY THE NUMBER OF PLANNING SHEETS THAT WILL BE NECESSARY. 1.) Each exterior door shall have a landing a minimum of 36" deep and the width of the door shall be made of cast in-place-concrete, mortared or interlocking brick. 2.) Any steps shall not exceed 7.5/8' riser height. 3.) Threashold height at exterior door shall not exceed 1.00"
5.) Verify or provide a minimum 3.50" thick concrete slab as footing for the walls of patio enclosure. 7.) 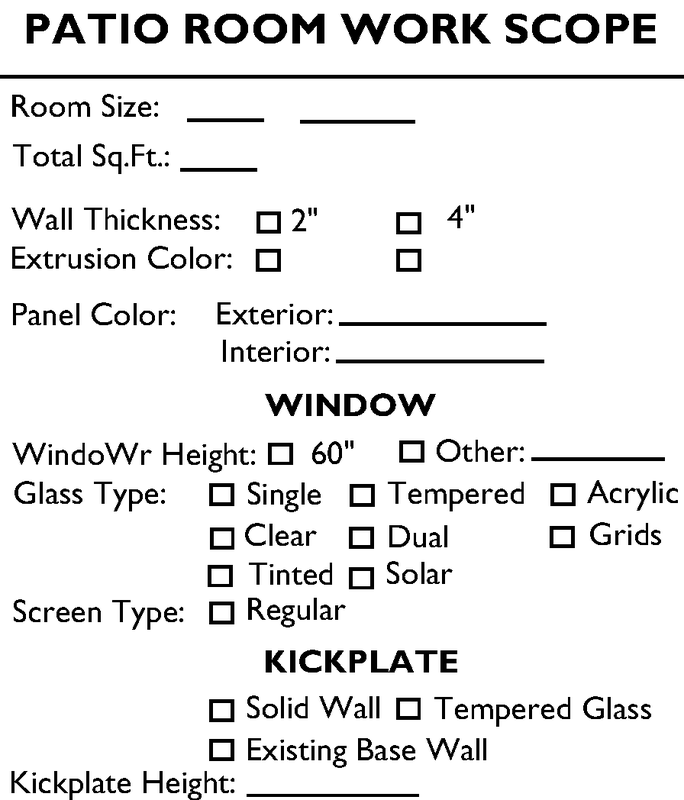 The patio enclosure shall conform to the requirements of California Building Code 2013 Section 3116: "Patio Covers". 8.) The longer wall and one additional wall of the patio enclosure must have a minimum of 65% open area below a height of 6'-8". 9.) Existing house doors leading into the patio enclosure shall remain in place. 11.) 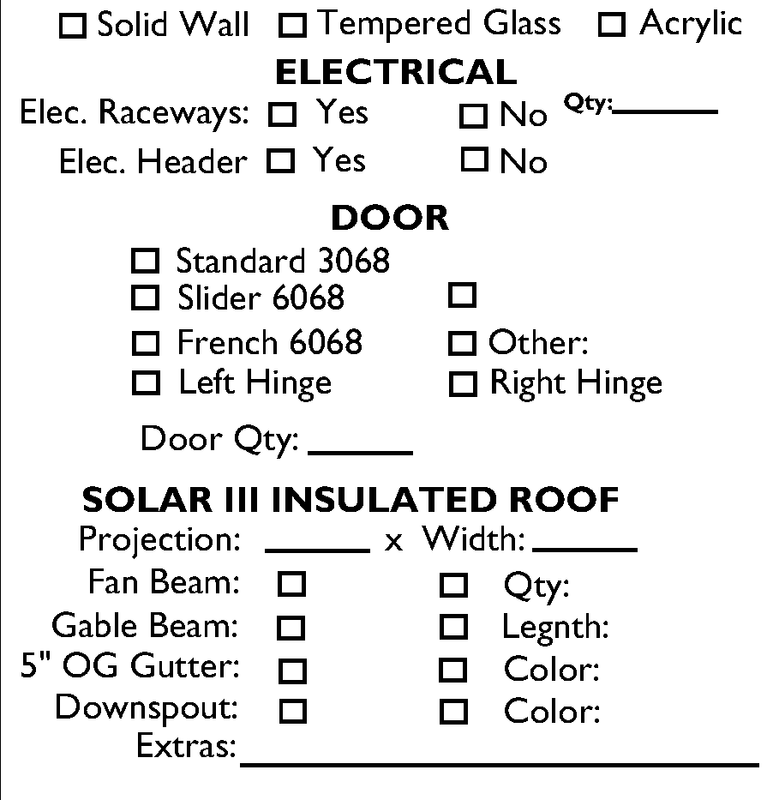 Provide new labeled circuits to patio structure for lights and outlets. 12.) Electrical outlets shall be protected with Ground Fault Circuit Interrupters (GFCI or GFI) in all outlets within the patio enclosure. 13.) Exterior outlets shall be both GFCI protected and weatherproof covered [CBC 210-8]. 16.) Proposed 1.C.B.O. patio enclosure to match existing exterior. 18.) Smoke detectors are required in all bedrooms, halls to bedrooms floor levels, etc.